Posted by M Bharath Bhushan in Art, Bathukamma, Culture, heritage, Identity, Mulki, regionalism, Telangana, Telugu, Vemulawada. 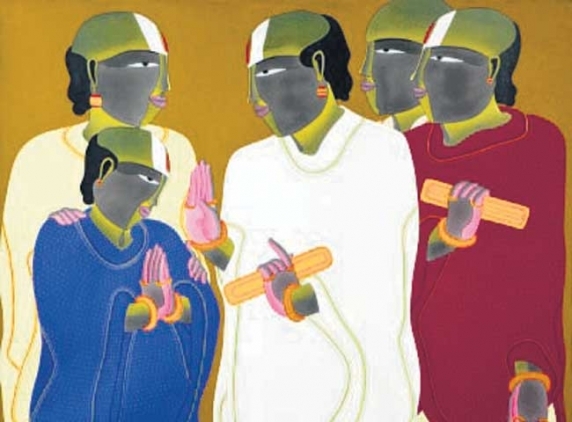 The brightly painted figures of Telangana men and women are Thota Vaikuntam’s signature style, he exaggerated contoured of reconstructed form, with highly stylised folk features and perspective mark his paintings. The morphemes, defined as the minimal meaningful unit of language, in Vaikuntam’s case his visual language, are the foreheads adorned with kumkum bindi amidst a plane of turmeric paste in case of women and sectarian marks for men. Textiles marked with dots, red vermillion dipped palms, red lips and elongated eyes are other characteristic features of his work for the last five decades or so. The feminine element is exaggerated in the full form, with midriffs peeking through vivid apparel that is flowing and yet clinging. The physicality associated with fecund femininity is emphasised through the use of shringar or adornment of the female self through body marks, make-up, ornaments, coiffure and the like. The men are comparatively less flamboyant in terms of clothes and decoration but no less dramatic than their female counterparts. Posted by M Bharath Bhushan in Art, Bathukamma, Culture, Godavari, heritage, Hyderabad, Identity, Karimnagar, Personalities, Telangana, Telugu. New Delhi, March 12 (IANS) The art of Thota Vaikuntam, leading Indian figurative painter, remains loyal to the aspiration for autonomy and a distinct socio-cultural identity of his native turf, Telangana. 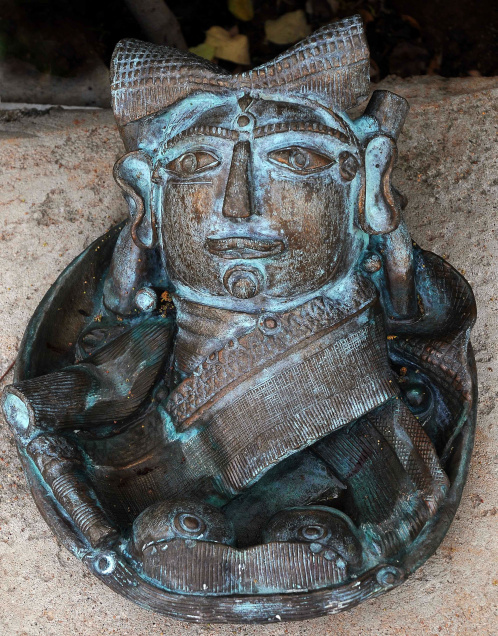 Vaikuntam is described as the most visible face of Telangana, his lines reflecting the battle for a separate state. Considered one of the best figurative artists in the country, Vaikuntam is often feted as the ‘Jamini Roy of the south’. He has exhibited worldwide and has been honoured with nine national and state awards. Posted by M Bharath Bhushan in Andhra, Andhrapreneurship, Art, cinema, Culture, Hyderabad, Identity, Mulki, Poetry & Songs, politics, regionalism, Settler, Telangana, Telugu. While some Telangana supporters maintain that Thursday’s act is an outburst against diabolical politicians and the state government shutting the city to prevent the agitation, others observe that the ‘T’ agitation is progressing or rather maturing from its focal point of Telangana region’s economic deprivation, so far, to elements of cultural and language differences between the two regions. They say the ‘T’ would no longer accept “Andhra colonial legacy” on its soil. HYDERABAD: A retired professor from a city college easily recalls numerous incidents of his Telangana accent being made fun of by his students or friends in his childhood days. He, like many Telangana supporters, often rued the poor representation of Telangana in mainstream media, particularly Tollywood films, and also lack of representation of ‘T’ culture and the regions icons in an “Andhra – dominated” Hyderabad. Posted by M Bharath Bhushan in agitation, Andhra, Art, BJP, Congress, CPI, Culture, Harish, Hyderabad, Identity, JAC, Kakatiya, Karimnagar, KCR, KTR, Mulki, politics, regionalism, Settler, students, TDF, TDP, Telangana, TRS, universities. HYDERABAD: In a major show of strength, thousands of people violated ban orders and removed police barricades to assemble at Tank Bund area here on Thursday as part of the ‘million march’ for a separate Telangana state. Protesters damaged some statues of Telugu leaders on Tank Bund, set afire a police vehicle and attacked a vehicle and crew of a television channel. 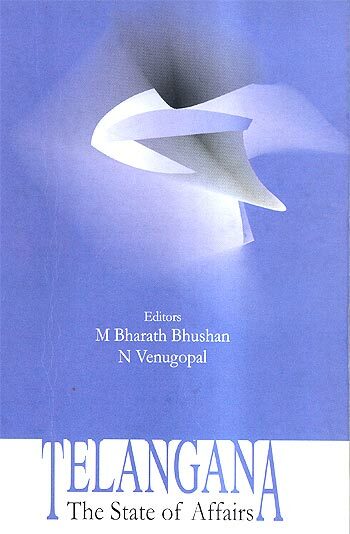 Posted by Telangana Utsav in Art, Culture, Essays, Hyderabad, Identity, Telangana. “Every time I come to this city I come alive. There’s a spring in my footstep and the vibes are positive,” an upbeat Salil Bhatt says, before he goes on stage. That’s perhaps because he traces his roots to this region. “We belong to Andhra Pradesh. We are from the Telangana region. About three-and-half centuries ago my ancestors migrated from here to Jaipur at the invitation of Maharaja Raja Sawai Jai Singh I,” says Bhatt, who goes on to add that his grandfather even went by the name Manmohan Bhatt Telang. Coming from a family of poets, lyricists, vocalists, dramatists, musicians, priests and spiritual advisers to royalty, it’s no surprise that music comes naturally to Salil. “I don’t believe in the 10-14 hour riyaaz. For me, two hours is enough,” says Salil, who often would be pulled up by his father for not dedicating that many hours as his other students would. “He’s a firm believer that when one enjoys one’s craft the outcome is more beautiful, otherwise it’s a ‘laboured’ performance,” he says. Posted by Telangana Utsav in Art, Culture, Hyderabad, Medak, Personalities, Telangana. Posted by Telangana Utsav in 1969, agitation, Andhra, Art, BJP, cinema, Congress, Economy, elections, G.O 610, heritage, Identity, KCR, Nizam, politics, Rayalaseema, regionalism, Review, Settler, SRC, TDP, Telangana, TRS. Telangana: The 29th state of India? If one were to pick up a single subject drawing public attention which had begun in the first year of the last decade and went on to continue into the next, then it would undoubtedly be the clamour for a separate state of Telangana. Till about the end of last year, this oldest movement for a separate state had just sporadically attracted national attention and media coverage. Despite a plethora of national leaders and parties talking about the issue, this movement in particular surprisingly never revved up to accelerate its political momentum, both at the state of Andhra Pradesh and the central level. With the fast-unto-death of K Chandrashekhara Rao (KCR) and the subsequent violence in the state, this movement has now effortlessly reached the top of the media ‘must-cover’ news stories. In 2001, after a much-publicised spat with Telugu Desam Party (TDP) and name calling with the party supremo N Chandrababu Naidu, one of its earliest members and party veteran, KCR quit the outfit and floated his own Telangana Rashtra Samiti (TRS). The raison d’ etre of TRS was that this erstwhile Nizam-ruled region of the state has been successfully discriminated against and its people overwhelmed by the influx of ‘settlers’ from other regions of the state ever since the formation of Andhra Pradesh in 1956. The emotive issue has since then remained at the centrestage of the state’s politics and has been raised as a key campaign issue during the two elections of 2004 and 2009, both for the Parliament and the Assembly elections. Unlike the ‘issue-less’ and rather painless creation of three new states in 2000 – Jharkhand, Chhattisgarh and Uttarakhand, Telangana had, till now remained confined as an issue to be dusted for animated campaigning during elections and ‘special’ occasions. In recent memory, it was in 1998 that the National Democratic Alliance (NDA) government in general and Bharatiya Janata Party (BJP) in particular broached the subject at its convention in Kakinada, in coastal Andhra Pradesh. Armed with a slogan ‘one vote, two states’ the campaign could not gather much steam as TDP, the dominant political partner of NDA in Andhra Pradesh took a dim view of this clamour for separation and did not find it appropriate enough. A recently released book Telangana: The State of Affairs (AdEd Value Ventures, Hyderabad) quotes thus: “Andhra Pradesh has the dubious merit of ruling parties espousing a separatist demand. It becomes imperative here to distinguish people’s aspirations for just opportunities and established political parties seeking to dominate the people, under the pretext of uplifting them. Civil society is yet to create the intellectual tools and action plans that can distinguish people’s politics from power politics. Posted by Telangana Utsav in Art, Culture, Personalities, Telangana. Bold, striking, and vivid — these are the words that come to mind when one thinks of Thota Vaikuntam. 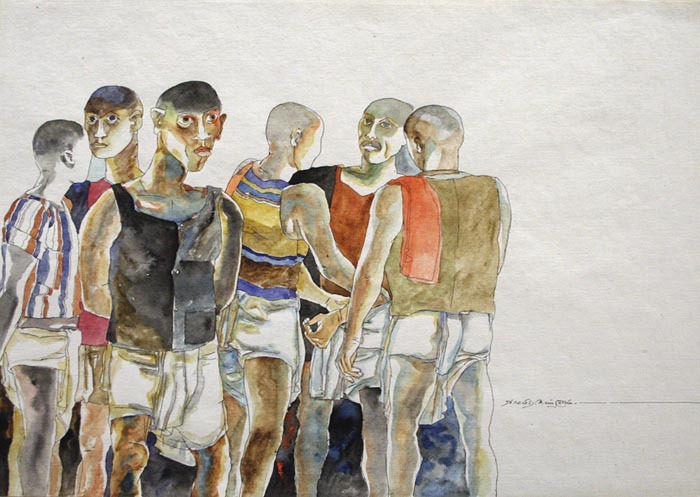 Known for his brightly hued paintings depicting rural Telangana life, Vaikuntam shows art-lovers a different phase of his work in Vaikuntam: A Deep-Rooted Tale, an exhibition of his early compositions at Kalahita Art Foundation. Laxma Goud’s prolific career, which spans over four decades, has been marked with tremendous versatility, both in style and medium. He has worked effusively in etching, gouache, pastels, painting and sculpture. Undoubtedly, though Goud is a master draftsman who, against the long-held dictum in the Indian market that an artist can only be successful by producing large-format painting, developed a writhing, bleeding line as his idiom of choice. By fleshing out the possibilities of sketching, he connects the rustic and raw qualities of his practice to his subjects’ physicality and psyche, generating a rather intimate relationship with his creations.